The 2018 Cleveland Thyagaraja Festival, the largest Indian music and dance festival held outside India, featured the Bharatanatyam performance of Guru Sujatha Srinivasan and her students on the last day at the Waetjen Auditorium, CSU. Accompanied by a live team of musicians, Sujatha presented a traditional repertoire, including songs dedicated to the legendary dancer T. Balasaraswati. Tiruvarur Girish and his disciple Lalit Subramaniam rendered vocal accompaniment. Shriya Srinivasan, Joshua George (nattuvangam), K.H. Vineeth (mridangam), R Thyagarajan (flute) and Sushmitha Ravikumar (violin) enhanced the presentation with their expert skills. Shriya Srinivasan, Nithya Kasibhatla and Sita Vakkalanka, students of Sujatha, exhibited their good training, dancing along with their guru. As artistic director of Shri Kalaa Mandir- Center for Indian Performing Arts, Cleveland, Sujatha has been successfully creating the next generation of front ranking Bharatanatyam artists. 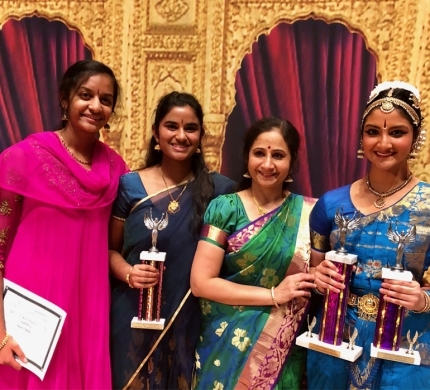 Sujatha's senior student Nithya Kasibhatla won the Grand Prize at the Bharatanatyam dance competition with an award of $1500 and a performance at the Chennai music and dance festival. Sita Vakkalanka and Sweta Balaji, also disciples of Sujatha, bagged top prizes in their categories among 270 competitors.